due to increasing age, frailty, or osteoporosis. but also on the lives of those who are close to them. With well over 300,000 hip fractures a year in the US alone – the vast majority from falls – clearly, more needs to be done to help prevent this devastating injury. At least 20% of hip fracture patients die within one year and even more become permanently dependent on the help of others. 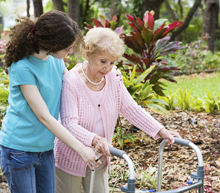 Increased attention to exercise, medications, and fall prevention programs, has already helped considerably. With more than 90% of hip fractures being caused by a direct fall onto the hip, the wearing of hip protectors is a logical complement to these measures. Until very recently, however, hip protector design has long required a compromise between efficacy and comfort. The harder the hip protector, the more effective—but also the less comfortable. The less comfortable, the greater the resistance to wearing them. FALL-SAFE HIP PROTECTORS, with pads featuring D3O Impact Protection technology, have been specifically designed to address this and other issues. Already widely used in sports, military, law enforcement, and industrial products, D3O's deployment in Fall-Safe Hip Protectors represents the first medical use of this leading impact protection technology with its exclusive molecular engineering—soft and flexible at rest yet rigid and protecting on impact. Worn all the time, Fall-Safe Hip Protectors are ready to protect whenever and wherever a fall onto the hip may occur. With their unprecedented impact protection, comfort, and durability, they promise to usher in a new standard of care for preventing hip fractures. "Beyond fall prevention: Solving the hip fracture crisis," by Stephen Robins, M.D., CEO and Medical Director of Medical Protection Technologies, has been published in the March 2013 issue of Long-Term Living. The invited article discuses challenges and opportunities in preventing hip fractures in at-risk older adults. MedProTech™, D3O® and Fall-Safe® are trademarks of Medical Protection Technologies LLC, Design Blue Ltd and Hip Impact Protection Ltd respectively.